This is a doodle I have been working on and off for a few weeks at about 20 mins. at a time. 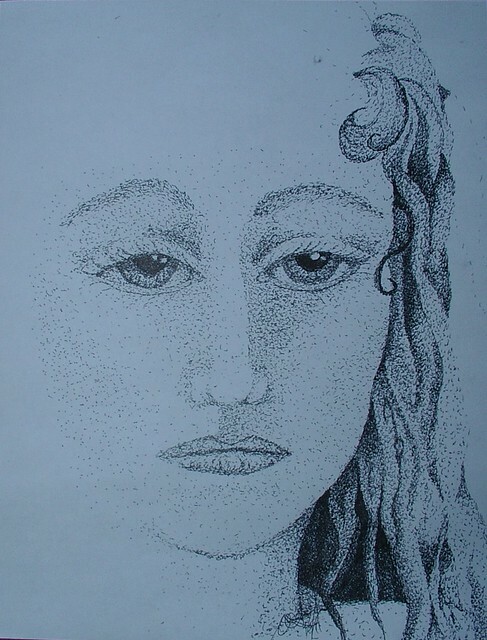 It is truly just a doodle not a drawing. Has a long way to go before it is done. There are some mistakes in it but since it is just for fun I don't mind. This paper is 8 1/2 by 11 to give you an idea of the size of this. Yes I do call this a doodle because it is just out of my head without looking at anything just playing with a gel pen that was in Mrs Culvers art class when I am done with this I think I am going to see if I can find my old Rapidograph pens as I like them better but I do have to admit these are cheaper and cleaner but I like the nib sizes on the rapidograph better I think I have the 7 pen set in storage if I remember correctly. They have made it to the weened stage and drink from a water bottle. Now the kids are back in charge of their pets thank heaven. There are 4 girls and 3 boys all the girls have homes 3 stay with my children and one is going to a friend. The 3 boys no one seems to want they are pretty cute my children wanted certain ones of them but hoped them to be girls as they didn't want more babies either. We are going to keep them till Friday and if still no one wants them we will take them to the pet store. All are healthy and active. 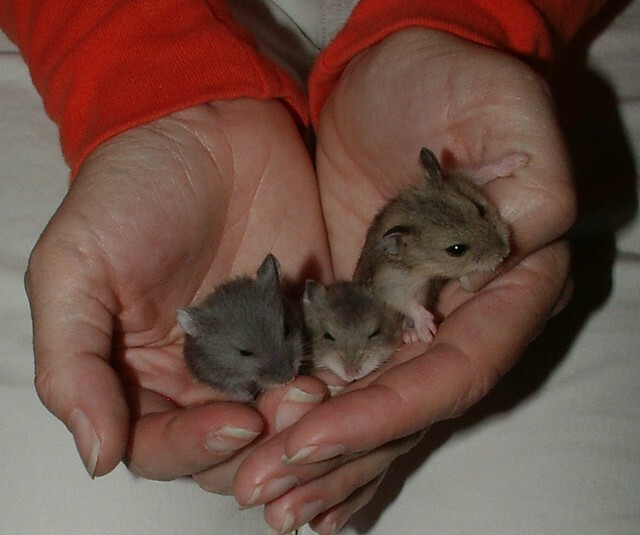 You shouldn't hear any more about hamsters as my children are taking care of them and not me I can get back to other projects fiber related. 1 of the boys went to school where he has a new mate and is quiet happy with his surroundings the smallest one the dark gray one. The other two went to a person in the neighborhood. Which I now wish we had not done: one was eaten by their cat the second day they had him ( if we had known they had a cat we would not have given it to them). We asked if we could have the other one back to save it from the same fate but they said no that they still wanted him and asked if we had more they could have. Um... no we don't and in our heads we are saying even if we did it wouldn't have gone to that home again. 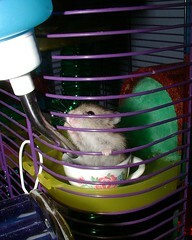 In hind sight we now know they have had a hamster before that met the same fate. It was very hard on my children to hear of this as we had worked so hard to save them after their mama died. We are pretty certain with that track record the other one will not live long either. The children in that home sort of bragged about it( One ran up to my children yelling about how it died and was eaten then the next did the same thing no remorse or sadness in them) so it made it all the worse for my little girls whom these are their first pets other than pragmatists. My kids had to work hard to prove they could have pets and be responsible for them. I guess not so for the other home. I hope if the other meets this fate they will not tell my children about it. 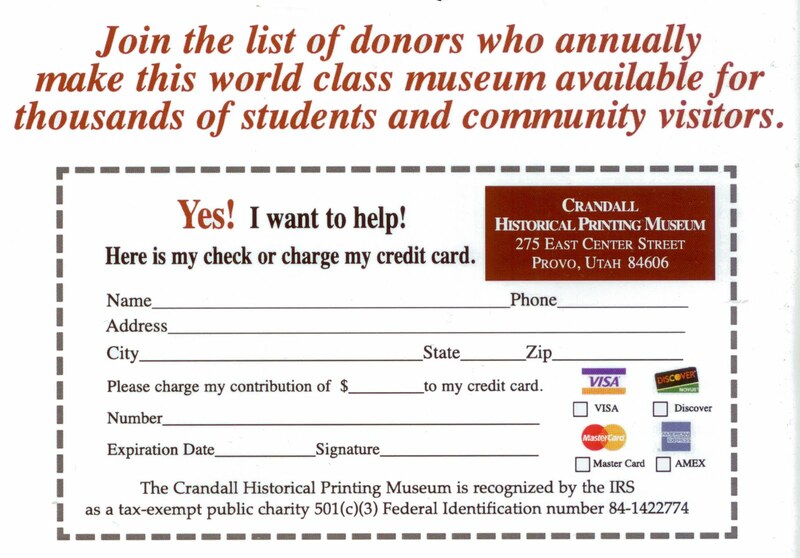 There is a Museum in Provo Utah known as "Crandall Historical Printing Museum" which has hit upon hard times with the economy. 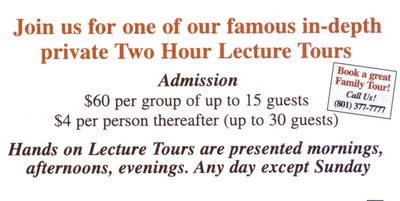 It is a one of a kind museum and it is great need of philanthropy and you can be that person. My children and I visited the museum today just because of my love for books and print. While there we learned of its plight as we visited with the founder of the museum after the doors had closed for the day we talked extensively as to what had happened and what needed to be done. I am trying to do my best to help save a true mom and pop museum that has world class items and should be a treasure to not just to those that live local but those all over the world. This has been in the news papers several times if you want to see more there about it. The irony of this is that in Utah April is Printers Recognition Month. So almost as soon as April ends if they do not get the funds to stay open then they will go out of business. 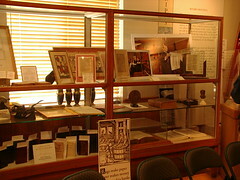 Why am I interested in helping this museum here is some of mine and its history. 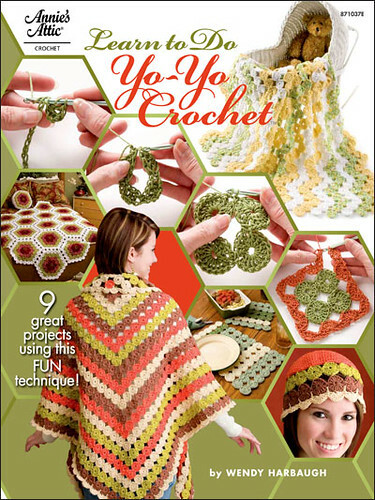 I was an art student at the Y (Brigham Young University) where I spent many an hour at Crandall house at the upper end of campus taking book binding classes from Valerie Maker in the lower levels of Crandall house (a different building with the same name as the museum). I also spent many hours in the conservation room in the Library taking honors book binding classes from Robert Espinosa. Two very great teachers with a great love for the paper arts and the written word in both type and handwritten. When I wasn't making books you could often times find me in the HFAC " The Harrison Fine Arts Center" ie. the art building. 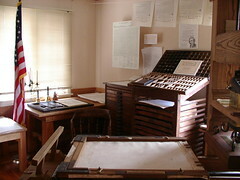 Where I would be found making intaglios, mono-type prints, lino-cuts and lithography. 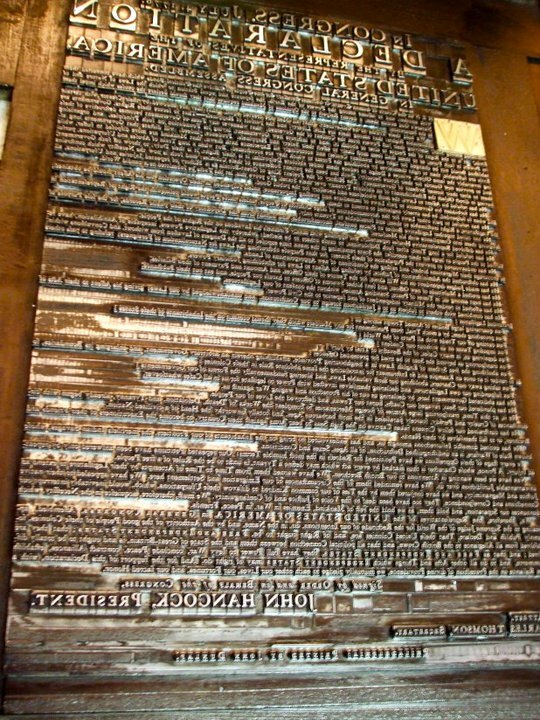 I never had a chance to do letterpress. I wanted too but ran out of time as graduation rolled near. 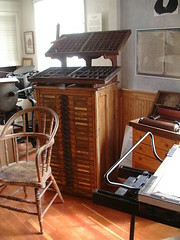 I now own a small printing press and an antique letter press type cabinet that has several drawers full of type. My dream is to get back into bookbinding and printing and have my own little studio in my home where I can once again play with ink and enjoy printing. May never happen but it makes me happy to have the dream. I know the printed word on paper is not near as in vogue as it use to be because of the Internet. Yet our lives would be so much different if it had never been and it is very important to know where type came from why it came about and how it changed the world. Well that dream I had other people have had such as Louis Crandall but he lives his dream which might be turning into a nightmare. 15 years ago he had a dream to open up a 501(c)3 non-profit museum all about movable print and where it came from and where it has gone in history. Located at 275 East Center Street in Provo , Utah 84606 in a very small little building that can easily be missed when driving past in this building his dreams came to life. 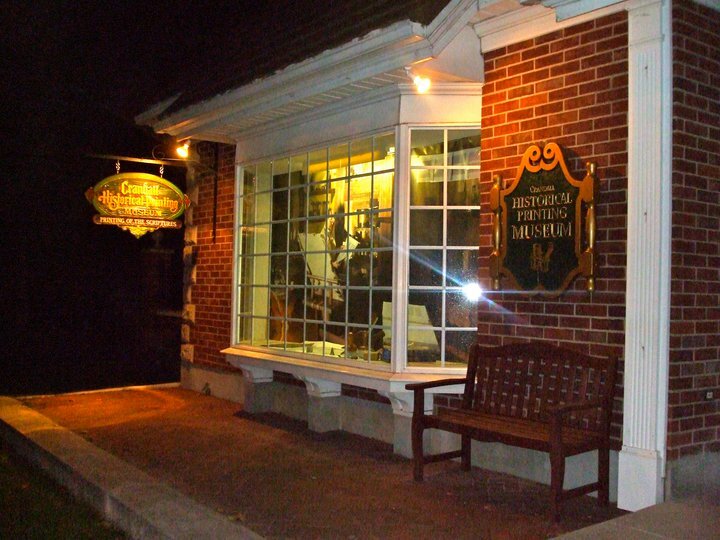 This modest little building houses some amazing items in printmaking history. 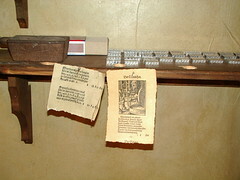 Movable type has changed the way the human race has looked at the world and interacted with it. Here is a little of the learning and teaching that one gets there. Since I am not trained in what and how they teach this is just a quick synopsis of what I saw and heard while there. 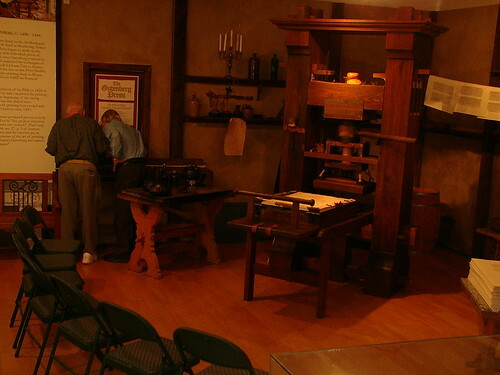 You start out the tour in a room that is decorated as a room would have been in Gutenberg's day and age. You are looking at a massive printing press with most of its parts made out of wood an amazing thing to me as the ones I always worked on in collage yep all metal. You learn how Gutenberg wanted to make movable type but how he had to do it in secrecy because people did not view new things in the "dark ages" as a good thing but something of the devil and witchcraft like. He had to create the type from scratch he had to learn how to make the type and that was no small feat as it had not been done before. He also needed to figure out which metals would work well from unhardened steel to form his letters on, then to temper it and make it hard so that it could then be pushed into copper and make a mold then how to use this mold with a lead mixture to make the actual type. To do this he needed to make a gadget that would hold the mold and form it from unhardened steel too. All these things were to be done by hand. Mind you while this is being explained to you the person explaining it is also making a letter in type for you I do not mean printing with one but casting a letter and showing the steps to get to the cast point.The explanation of how the type is set into phrases before it is placed into the frame on the press bed. The thing I forgot to say about the type is that the original type had to look like handwriting becasue the people of Gutenberg's time of course were use to handwritten books and it needed to look like that or it would be rejected. Try to write all your letters the same then carve them by hand out of steel and make them all fit size wise with the letters next to them, no small obstacle as Latin which is what this type was in had over 250 letters that needed to be made becasue of the markings that went with the letters. Then we go into the discussion of how the ink was made and that no one has made an ink that was so beautiful and rich and black since ( because we don't use lead and such). Small note he had to create the ink too as it had to be sticky and thick and ink used for writing was thin and watery and would not work with type. Now on to how to ink the type with rocks and rolls of a beater. Yep we have our first rock and roller and it wasn't Elvis. You have to roll the bumpers in the ink then rock it against another bumper to transfer the ink then you have to beat the type with this tool. Of course you guessed it Gutenberg had to create that too. So now we can print or can we? Yep paper is needed hand made paper was great for writing on but not for printing on and besides books where printed on velum more difficulties to figure that one out. 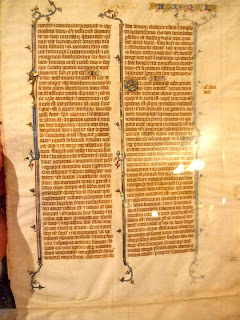 Part of Gutenberg's bible had to be printed on vellum but latter in his printing he did use paper. 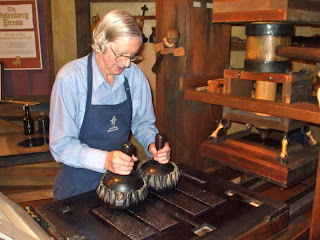 Which he had to account for the issues with hand made paper it had to be damp to work well for printing. Any one who has gotten paper wet knows how paper drys warped and wavy another thing he had to figure out. Now on to the press oh some one else figured that out for pressing fruit to make juice (wine and the like) but it had to be modified for printing. Yes another thing had to figured out. I would care to say that printing as we know it today is an amazing thing that we take for granted. 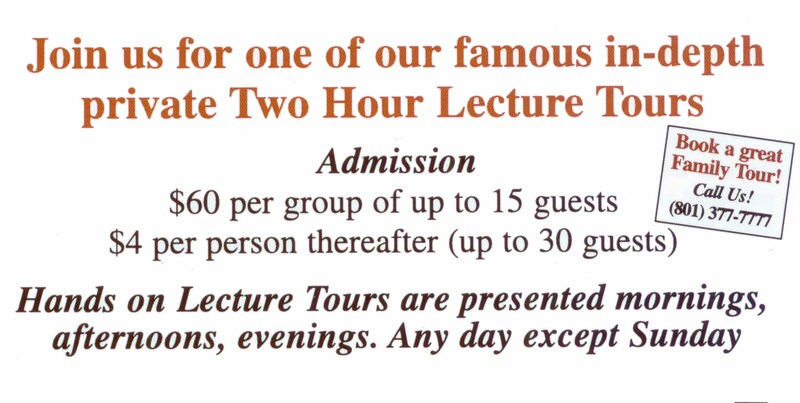 There is more that happens and is discussed in this first room of the 2 hour tour. Oh and the person demonstrating this does it in less than 15 mins. Amazing since it took Gutenberg 20 years to figure all this stuff out. I am hoping you are learning something you did not know and come to appreciate the simplicity of buying a book or even a magazine these days becasue with out Gutenberg it probably would not have been the same. 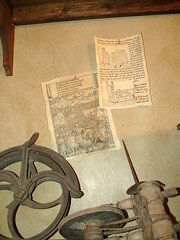 Moveable type brought words to the masses and education to the poor. More is discussed and learned in this room. 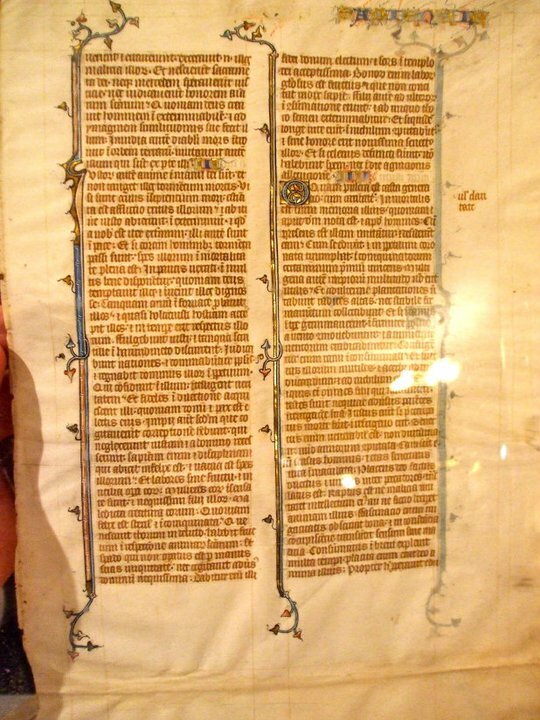 From ancient illuminated pages that you get to look at up close and personal in your hands to reproductions of the Gutenberg bible volumes 1 and 2. There was hands on experience for the children and adults as the group pulled two pages from the Gutenberg bible (typeset in Latin). It is interesting to note that before finishing his dream Gutenberg actually lost his shop to his debtors and someone else had to finish his work. Louis Crandall has not yet fulfilled his dream and he too may be loosing his shop to his debtors. Please step in and be the one to help finish this dream and keep a very special one of a kind museum going. From here (Germany 1450's) you travel to the next room (Philadelphia 1776) where we learn about Benjamin Franklin and the effects the printing press had on America becoming a nation. In this room decorated with items of American Patriotism and things that remind one of the Revolutionary war era. 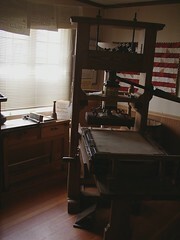 In the middle of the room stands an English Common Press (this press is an exact copy of the one in the Smithsonian). 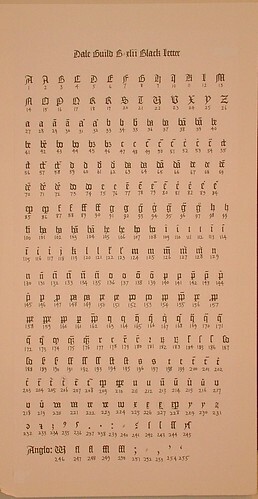 There are examples of Pour Richards Almanac printed around. We are led through a discussion about how Benjamin did not want to apprentice to be a soap and candle maker like his father and took a while to figure out what he did want to be. Finally he set his mind on printing. Once he had learned the skill and went out to make his own business he learned it isn't always easy to make a living on books so he started to print the almanac and sustained his good living on that. Most of the things we actually note him for doing came after he had retired from printing. It is a wonder the things a person can do while in retirement. 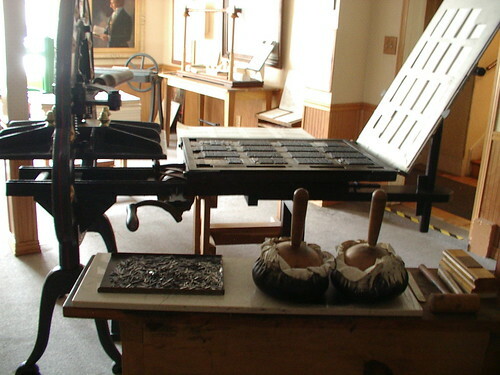 The importance of the press and movable type is discussed about how the American revolution began with lead type in the form of printed words like Common Sense and the Declaration of Independence. 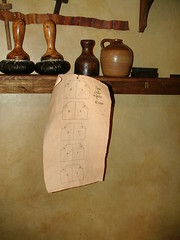 Lead bullets came after the lead type in the battle for freedom. There is more that is said and shown in this room but I want people to still learn things when they go and just get a taste of what happens there. 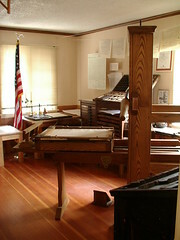 The next room on the tour takes us to another leap in time and faith to 1829 Palmyra NY and the printing of the book of Mormon in the E.B Grandin room. The room in which we stand now is almost the exact size of the room that the Book of Mormon was printed in except for 2 feet short in length to give an idea of the small spaces things had been done in ( 35 ft x 17ft). 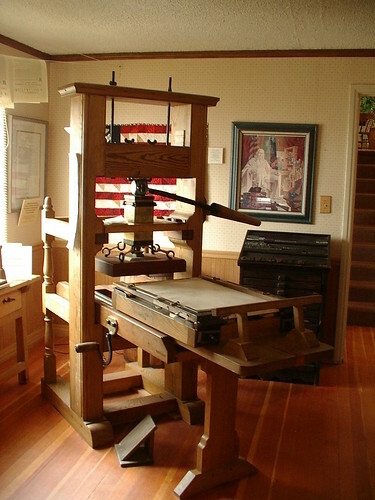 The growth of the Latter Day Saints (most people call the Mormons) is solely due to the use of the printing press. In this time a large run of a book was about 500 copies and that was considered a very large run but the book of Mormon was a 5000 copy run. 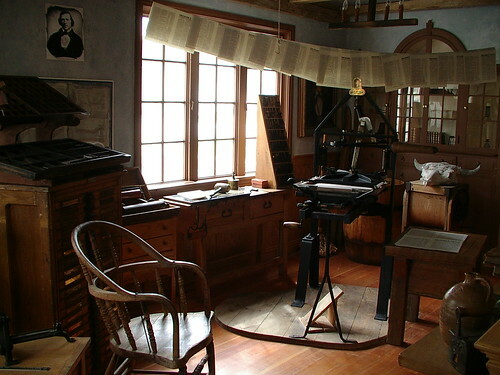 The printer was given a farm to make sure the debt to pay for the books would be secured. 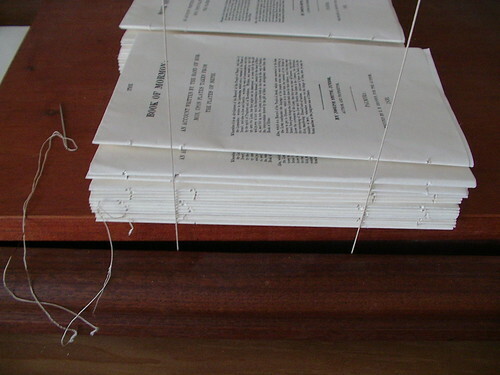 Just the binding by hand of so large a run would usually take over 2 years to complete. So another amazing feat in the human spirit that sees a larger goal that will encompass many years of ones life to achieve. 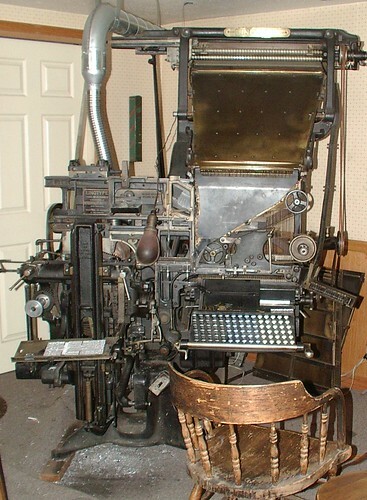 The press we are all looking at now is an Acorn press. 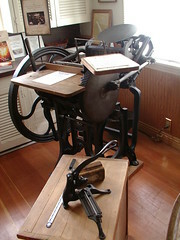 It is known by this name becasue the shape of the press is acorn like. 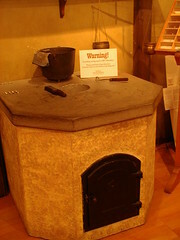 It is all cast iron and weights close to a ton. There are other machines in the room we are told to ignore as they are of a different era that we will get to later. 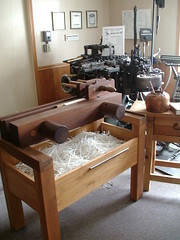 A 1930's line o type machine that still works and a mono-type machine from a little later than that. So much knowledge and history in such a small area of space. 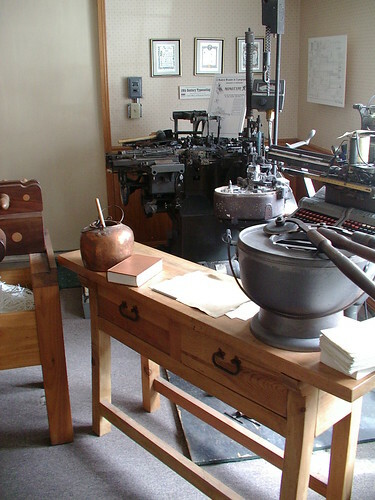 Back to the acorn press set in type on the presses bed is the first 16 pages of the book of Mormon to show how it was done. Sitting in a metal tray next this press is a stack of lead type all mixed up. Yes when they originally set this up there was an accident and page 13 was dumped (no jokes on the number please) and they the museum people decided to leave it that way so that patrons could see how hard it would be to sort type that has been dumped. Through out the exhibit things are hands on and you are aloud to touch the types and also are told that please wash your hands as type is made out of lead and is poisonous. To think the people that discovered printing and used it help our nation be born and to carry out the word of God had all been poisoning themselves (unknown to them of course) to help others. Very humbling indeed! We are shown how the pages are printed to make the signatures of a book, and one is folded in front of us. 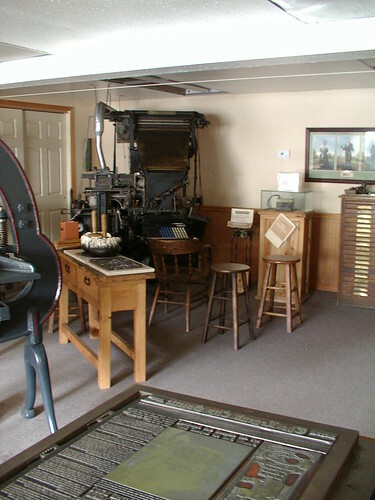 The we are shown a book press on the other side of the room and is purpose in making the pages lay flat. Oh and becasue of enhancements in paper making papers no longer have to dry but are printed on dry paper making printing even faster. We are shown how a book block is planed and how it is glued up and formed into a final book. 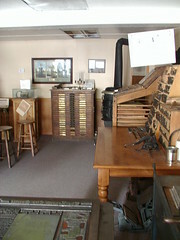 Next leap is to 1850 Salt lake city to the printing of the Deseret News newspaper. It is now 400 years after Gutenberg and although much has changed in the world printing is still done letter by letter and still inked up in similar manner (roller brayers over balls but similar concept and idea). 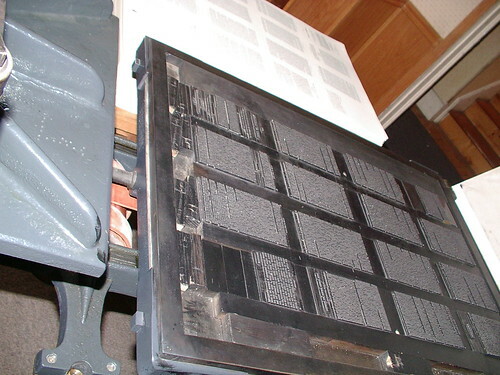 There is an example of the first page that came off of that press. Dated June 15 1850. There is a similar item up at This is the Place Monument but I have seen both and this one has a far greater impact on the visitor becasue of all the information that has led up top this point. Next leap 2011 the internet has concurred the world and people carry around digital books the text and touch and feel of a book are fading away from us. As a bookbinder and printer that is a hard thing for me to grasp I so love reading a book and gaining knowledge from it most hings I do I have done becasue of books and being able to sit and teach myself. I love books old and new there is something about them that draws me to them. The economy is languishing and many museums are closing their doors and not for the weekend but permanently to never come back. There is a legacy to be had in our history and what got us here as a world the printing press has changed the face of this earth. It has helped create nations and it has set people free spiritually progress has moved forward becasue of type. Please help this museum stay to give a great legacy in our children yet to be born. If you have been there and know the value of this museum and what it stands for or if you feel touch by my notes here call, stop by, donate anything to help and do it fast or they will close their doors and you may never be able to see the wonders of this museum. It is truly a one of a kind place. 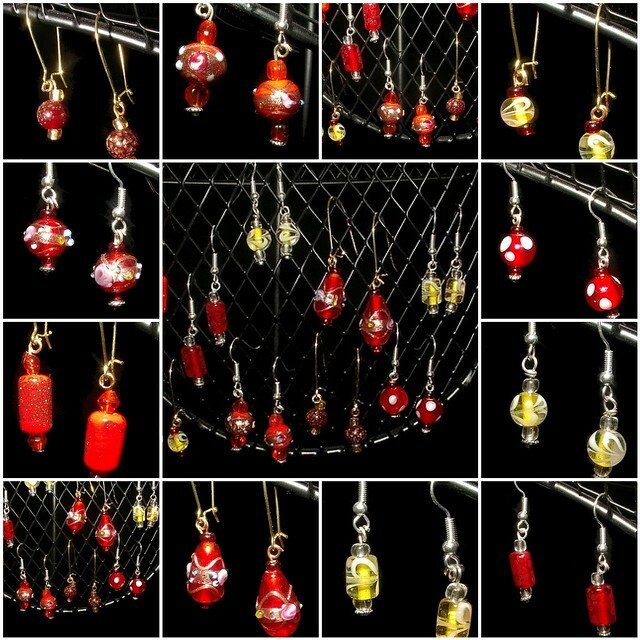 If you are interested in looking at their web site go to Crandallmuseum.org (they have a donation link in place on there but are having technical difficulties with it and paypal). 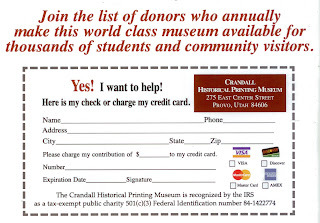 If you choose to donate to them you can mail them money ( if you do make it rush so they get it in time to save the museum)or call and use a credit card or stop by and give it in person and enjoy the museum too. They are working today to get the credit card/paypal thing fixed on their web site but have been told it may take a few weeks to get that all fixed. I am still working on this just not getting much progress becasue of the hamster babies, spring break, and fittings for the Shakespeare play "The Merchant of Venice". 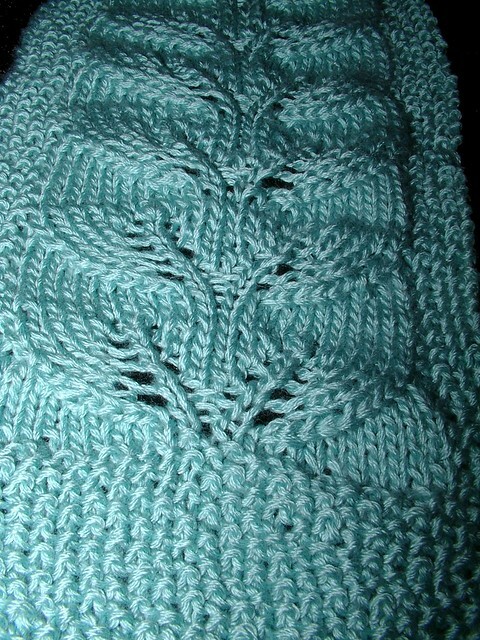 But I like how it is coming out all the same I am starting to think I will make it as long as the pattern calls for. I have not made as much progress as I would have liked as I could not keep my mind clear the last time I worked on it and I had to keep frogging parts. Not the pattern's fault but mine. 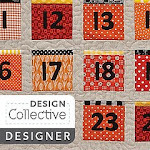 Also this doesn't seem to be a pattern my mind wants to memorize all of so I have to look at each row once which is sort of annoying as usually a repeat pattern like this I have memorized by now but it just isn't happening. They are still growing and strong. 7-8 more days and they will be totally weened. Not sure of their age they are either born on the night of the 5th or the early morning of the 6th. 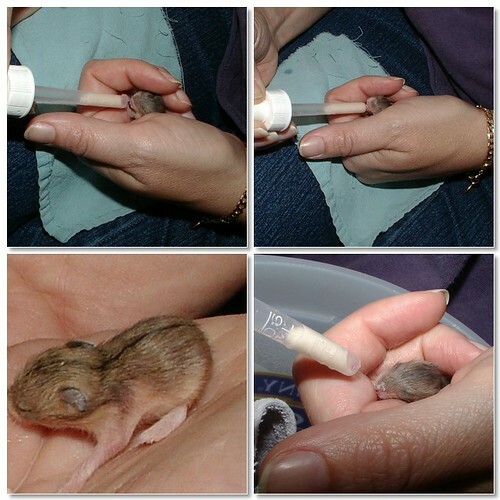 It is getting much easier to feed them as some can drink from the water bottle which is full of 50/50 water and unflavored pedialite. They are also still being feed 50/50 water and evaporated milk. We are calling them all "little chubbers" ( this is said in an endearing way ) as they are all so round now. When they sit it looks like a little fuzzy round ball not an animal they are so round. Which is pretty cute I have to say. Some have asked what we are feeding them so that is why I am posting this. 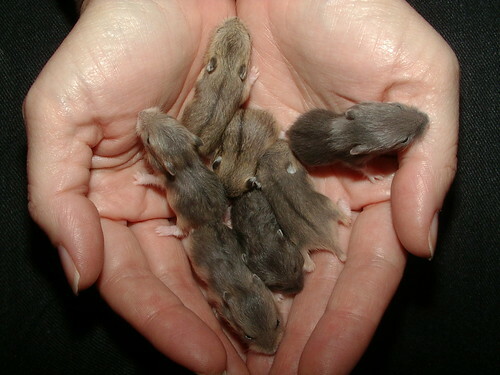 As I have already mentioned some above, but they also are eating small seeds and grains ( from normal hamster food we have removed all the large items) that we have added some rolled oats to and wheat germ, and wheat bran, and powdered milk and cooked egg yokes mashed with powdered milk on them. Every now and again a frozen split pea to give added moister and it is just fun to watch them try and hoard the frozen item from each other as they all want them and of course do not want to share. 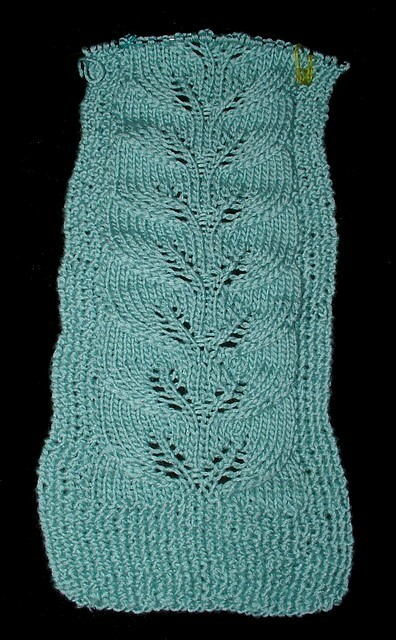 This pattern is from Vogue knitting from the spring/summer issue of 2010 pattern#27 in that issue but they also have it available for free on their website. I am making it out of a blend of acrylic/rayon from bamboo. The yarn is SPA by naturally Caron have not worked with that before real soft to the touch not fond that the yarn splits easy. This color is known as Ocean Spray. 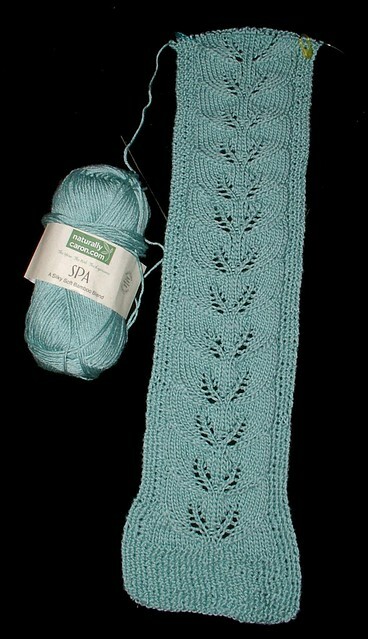 I like it a lot not quiet powder blue that the pattern called for and not so dark as to become turquoise either. It is supposed to have 46 (I think) repeats of the pattern and be a scarf that is over 5 feet long so you can wrap it a few times not sure I am going to make it that long as I never wear scarfs that long. 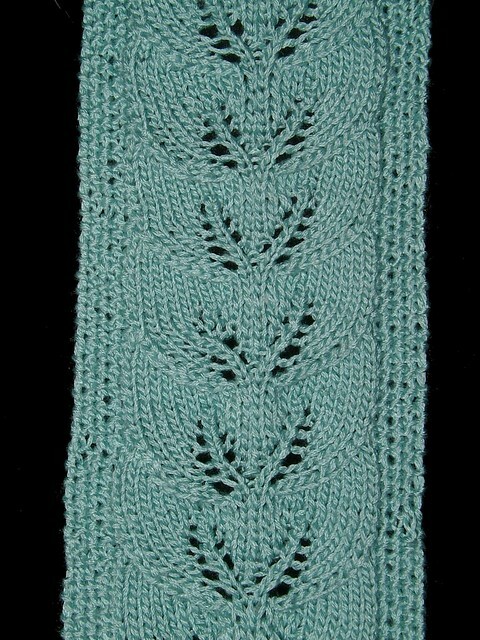 So we will see if I do what the pattern reads as or if I do my own thing usually my own thing wins out. 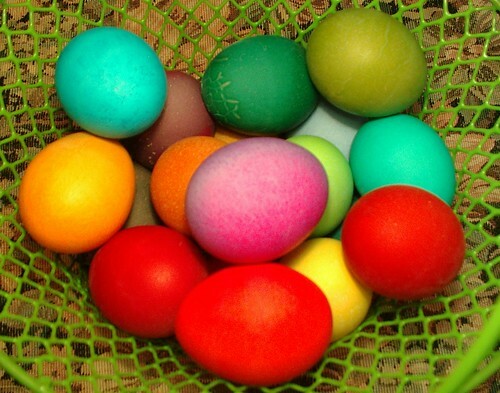 If you use brown eggs instead of white with your traditional Easter egg dyes you will get richer colored eggs. 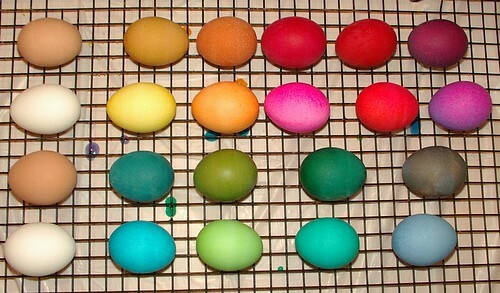 Here I will show both white and brown eggs dyed with the same dye I have let my eggs set in the dye bath for 10 mins. 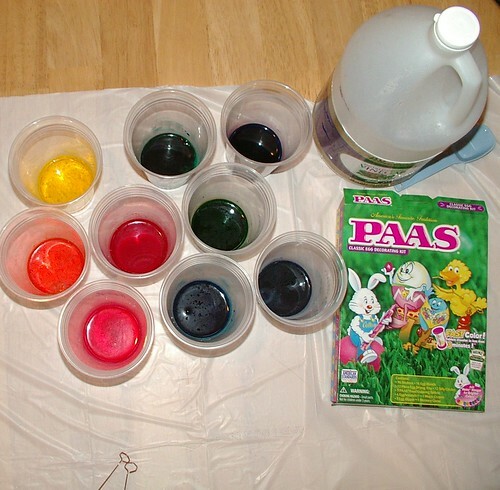 Let eggs set in dye for 5 to 10 mins. If you like the speckled look of the eggs pull out after only 3 mins. Other wise leave in longer for a jewel tone look to your eggs. 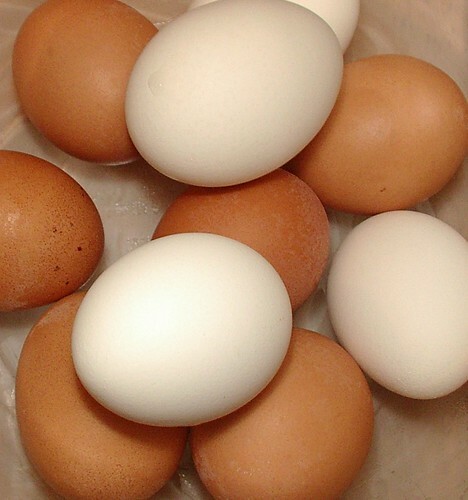 Here are my eggs that I dyed in alternating rows of brown eggs and white with the colors used above each other so you can compare the colors for your self and see the difference the color of the starting egg makes on the finished item. You know when you tell a child they can have pet you always know in the back of your mind it somehow is your pet too even if you didn't want it. 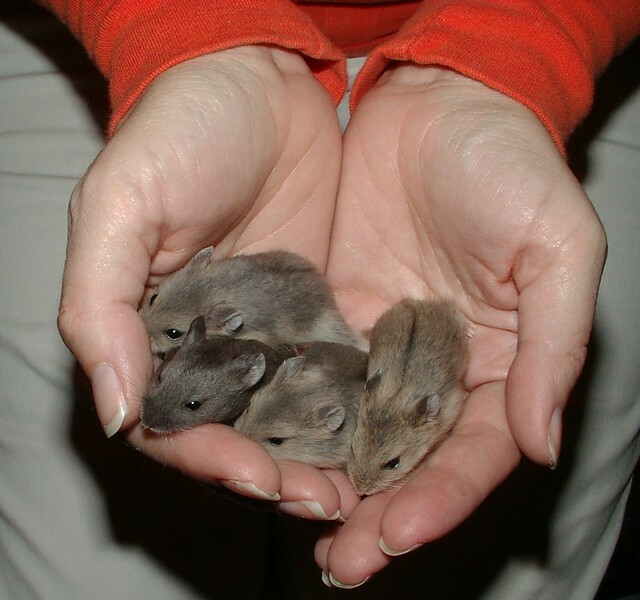 The children all made promises to take care of their hamsters and they have done a great job. 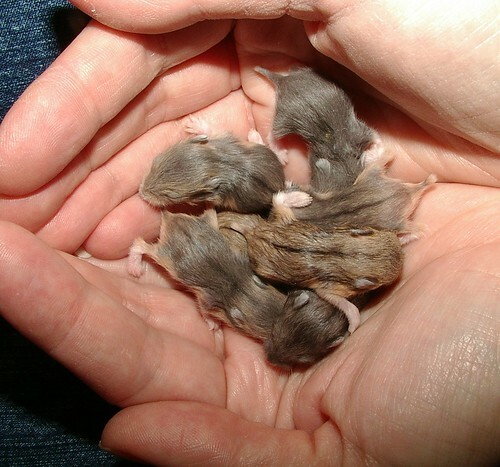 The mother hamster died and we truly do not know why something to do with the birth is all we can figure. The babies are so small it is too great a responsibility for my girls to take care of and be at school all day , also because they are scared they will hurt them. So the job has fallen to me I remember vaguely doing this as a kid with my cousins hamsters and I hand-fed many a baby bird growing up (my mother use to raise birds to sell so it happened often I would have to feed some from the incubators). But you know I just had not planned on this and the lack of sleep. At the same time they are cute and have done nothing wrong. Yesterday we figured that they truly had not had a good meal in a few days from mom as they were so so weak, sleepy, skinny and starving. This morning after around the clock feedings they are active running and eat not near as much at one setting as they did yesterday, I would guess their little tummies are staying full. My girls made a little pink coffin for the hamster and buried her in the yard yesterday and carved (scratched) into a little stone the name Midnight and said good bye to their hamster. Children are so sweet and tender hearted I feel bad that they have to go through this but at the same time it is part of the life cycle birth and death. They learn so much in a matter of hours having pets. I know most of my readers of this blog probably wonder why I am talking about the kids pets well. This has been such a growing experience for them to learn where babies come from in detail trust me they understand it all, we have had in depth discussions as to exactly how babies arrive from start to finish, to why parents die when their children still need them and how to help those who can not help themselves. It touched me and I wanted to share. 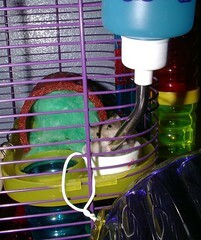 Plus hamsters are cute at this age you won't get me to say that when they are grown and cranky but for now they are cute. 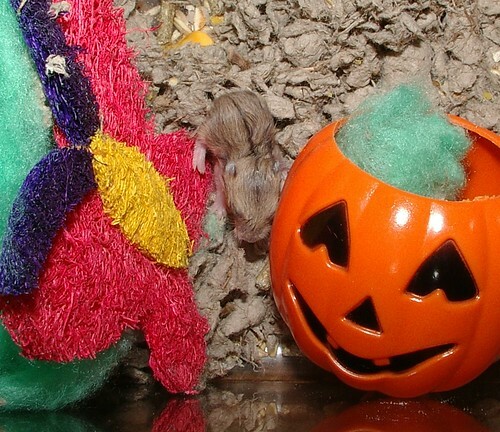 Three of the hamsters love this pumpkin to sleep in their mama did for a little while too so it probably smells like her. Every thing else in the cage is new and clean so they will not get sick. But she wasn't in the pumpkin when she was sick so figured it was ok.